"The Limited" pickups have been produced exclusively for OEM guitar manufacturers and is now available to you. 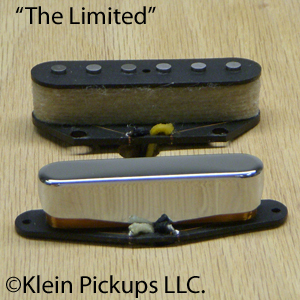 The limited set is a full, round, thick, and chunky set of pickups. Specially gaussed Alnico 5 magnets, 42ga Heavy Formvar magnet wire, and white cotton wrap construct this set. Looking for more of a strat sound in the neck of your tele? The Limited neck is constructed to provide just that. Alnico 5 magnets, 42ga Heavy formvar. The output of the neck pickup provides a thicker and fatter low end with out the ice pick on the top end. The Neck pickup also with it's moderate output doesn't overly drive the amp. The bridge pickup is wound with more turns which brings out the bite in your tele. This bridge is wound just enough to avoid the category of high output pickups but still has the thickness and full drive for players who don't always want the "Twang."